Author Daniel Pinkwater has just released The Yggyssey, a Young Adult book about a girl who lives in a haunted hotel. When I got home from school, my room was full of ghosts…again! They were being invisible, but I could feel the cold spots in the air. “Did I speak to you ectoplasms about this, or did I not?” I asked the empty room. Silence. The ghosts were dummying up. There was a faint smell of cigar smoke, the trademark of the ghostly Valentino, so I knew he was among them. And my bedspread was rumpled. Probably they were sitting on my bed, playing cards. The management had sealed off a large apartment because it was way too haunted for living guests to put up with. The hope was that if they gave the ghosts their own space they wouldn’t haunt the rest of the hotel so much. Some hope. “So you crowd in here so you can bore me, and stink up my room,” I said. I was mad. I really liked most of the ghosts, but a woman is entitled to some privacy. Grumbling and mumbling, the ghosts climbed out my bedroom window, made their way along the ledge, and climbed into the window of the apartment that had belonged to Valentino in 1927. I had been in the apartment lots of times. Like the ghosts, I had to climb out my window and go along the narrow ledge to get in, which was a little scary to do if you weren’t already dead. I doubt I’ll wait for the whole thing online; I’m sufficiently hooked by the first few chapters that I think I’ll be adding this to Shadowboy’s bookshelf in the near future. Hello, new hostess gift. 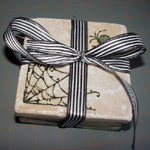 These are coasters made of plain old tile, stamped with spooky stamps. The About a Bit of Everything blog gave me the initial idea for this project, but I’ve modified their directions slightly. My tutorial is here. This is a fantastic gift to make in advance and put aside until you need a quick little something. With an assembly-line approach you could turn out dozens of sets in very short order, and it’s not like they go bad. I love having a selection of little gifts on hand, and I’ll definitely be adding these to my stash. (As usual, you can purchase the model here). 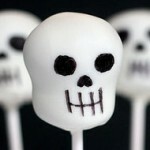 The CakeWrecks blog has a post that’s a tad harsh on spooky wedding cakes. Admittedly, a couple of the examples in their post are a little cheesy for a wedding–although I’d love the toe-tag picture on an anniversary card–but they’re not so much “wrecked” as just out of the blogger’s comfort zone (if you really want to roll your eyes, read some of the comments). Some skull cakes from Cake Alchemy. An elegant Pumpkin design and a nice Corpse Bride theme from Pink Cake Box. Another Corpse Bride design from Wild Cakes. Check out the cloud of little blue butterflies surrounding the cake. A Halloween/harvest theme from Carlucci’s Bakery. This one would be reasonably easy to replicate, since most of the decorations are fondant cutouts rather than icing. Several designs from Let Them Eat Cake. This is an all-Flash interface, which I hate SOOOO much because it won’t let me link to individual pages, but if you click on the thumbnails there are some spectacular designs. I’m especially blown away by the Nightmare Before Christmas cake about halfway through the slideshow. Any of these beat the daylights out of ecru buttercream and doves. Update: The CakeWrecks “Sunday Sweets” post added some much nicer undead cakes. Jonathan Coulton, whose Re: Your Brains I listen to on repeat more than I should probably admit to, has just released a new song. Blue Sunny Day is a cheerful, bouncy tune about a suicidal vampire. Though once I had decided to use the phrase “blue sunny day,” it was hard not to notice that the word “blue” can have another meaning. 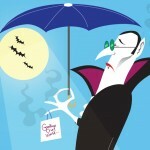 From there it’s only a quick jump to vampire suicide. Len of Monster by Mail created this drawing based on the song, which I desperately want on a T-shirt. Anyway, should you be in need of a little pick-me-up, it’s hard to go wrong with angsty, desperate lyrics set to a perky little tune. *As someone pointed out on his site, by using the themes of both suicide and vampires in this song, he has become the first person ever to successfully manage a jaunty Jeff Lynne-styled goth tune. Over at Urban Threads they’ve posted a nice tutorial for making a grunge-type shirt with a Western motif. Their design uses machine embroidery, but if you don’t have access to a machine you could certainly do something similar with hand embroidery, fabric paint, or premade patches. I like that there’s a lot going on with this shirt but it all blends together harmoniously. It uses a variety of crafting techniques which might inspire you in other endeavors. I’m especially taken with the freezer paper/bleach stenciling thing. It’s a shirt for a man. As the tutorial notes, men are hard to craft for. This is a really appealing handmade piece with no whiff of cute about it. Win! Be sure to check out their other tutorials, too; they’ve got all kinds of good ideas. Bakerella is famous for her cake pops: You crumble up a sheet cake, mix it with a can of frosting, form the resulting “clay” into balls, and dip them in chocolate. She recently did a whole set of Halloween-themed pops, including skulls, bats, ghosts, and spiders. Her posts includes a “parts list,” and while she doesn’t give instructions for decorating individual pops her photos are clear enough that it’s fairly easy to figure out what you should be doing. She inexplicably omits vampires and zombies from her lineup, but either one would be fairly easy to do. It’d be fun to put together a themed set of pops: Classic movie monsters (Mummy, Dracula, Wolfman), Frankenstein and his Bride, Harry and Hermione, or whatever strikes your fancy. In days of yore (before indoor plumbing), it was common for a lady to give her knight a token of affection to carry into battle. You can do something similar whether or not your beloved heads off to work every morning toting a broadsword. I’ve put together a tutorial for making a simple cross-stitched bracelet that you can personalize to your heart’s content. This is an easy and romantic gift, and would also be an excellent item to give to groomsmen/bridesmaids for a medieval wedding. (Incidentally, my workshop is beginning to get cluttered with prototypes, so I’m selling a few of the items I’ve made for tutorials in the One-of-a-Kind section of the store. If you don’t want to Doom It Yourself, you can buy it cheap. The bracelet shown above is available here). Are you guilty, as so many people are, of treating zombies as second-class citizens? All they want is a little respect. 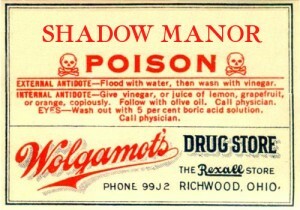 I was digging around in my archives recently and found some scans of vintage poison labels. I haven’t played around with PHP and GD for a while, so I wrote a little “pick your poison” generator which will let you add your own text to the labels in an authentic-looking font. Add friends’ names and use them as place cards, or soak the labels off of wine bottles and substitute these. They’d also make cute “save the date” reminders with wedding details printed on the back. Spookshows – Nice high-resolution scans of vintage labels. Virtual Bargains, Go Antiques and Collage Closet all sell real vintage labels. These would be fun to use in a collage, or framed and matted separately and massed on a wall. Alpha Stamps – The “Doc’s Black Bag” collage sheets have some attractive reproduction labels. Recently Zan did a list entitled, “Things I Sometimes Imagine Against My Will,” and Maggie followed up with a similar list of her own. Glancing out the bedroom door to see something large and humanoid scuttling up the stairs. Riding on a funicular and feeling a lurch as the cable snaps. As I pass the row of stuffed toys in my son’s room, they turn their heads to watch me. Washing dishes, looking up to find a stranger with crazed eyes staring at me through the kitchen window. Falling into a hole to another dimension, being unable to get back out. Waking up at night to find a shadowy figure standing at the foot of the bed. What are some of yours? Unburden your psyche in the comments!